Falcon 9 is a family of launch vehicles that are built by SpaceX. It is named for its use of nine rocket engines. It is powered by liquid oxygen (LOX) and rocket grade kerosene (RP-1). The current "Full Thrust" version can launch payloads of up to 22.8 tonnes to Low Earth orbit. It can launch up to 8.3 tonnes to geostationary transfer orbit (GTO), when it is flying in expendable mode. When it has been launched to GTO with a payload of 5.5 tonnes or less, the first stage can land automatically. .
NASA gave SpaceX a Commercial Resupply Services contract to launch Falcon 9s with cargo Dragon capsules to the ISS . Now SpaceX is trying to human-rate the Falcon 9 so that SpaceX can launch crews to the International Space Station. 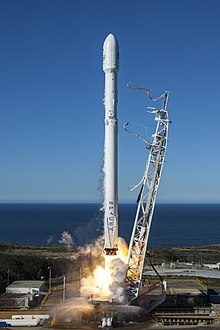 The first version of the Falcon 9 flew in June 2010. The latest version, Block 5, was introduced in May 2018 with increased engine power and other changes to help recovery and reuse. ↑ "SpaceX - Capabilities and Serviceswork". Retrieved June 26, 2018. ↑ Amos, Jonathan (8 October 2012). "SpaceX lifts off with ISS cargo". BBC News. Retrieved 3 June 2018. This page was last changed on 1 August 2018, at 23:42.